The Mizell Senior Center’s 10th annual “Stars Among Us” gala was held at the Palm Springs Air Museum. Marilyn McCoo and Billy Davis Jr. from the legendary 5th Dimension entertained but the real stars of the evening were in the audience, raising more than $400,000 to benefit the Mizell Center’s signature program, “Meals on Wheels” serving 120,000 meals each year to homebound seniors. “One Night. Souled Out” was indeed sold-out with a capacity crowd of nearly 500 guests. The museum’s planes moved out and New York City moved in. One hangar became “Central Park” for the reception and silent auction. Then guests took a short walk into the next hangar, which magically recreated the “Apollo Theatre” for dinner, awards and Motown entertainment. The Galaxy Award was presented to Palm Springs Modernism Week by PS planning commissioner JR Roberts and accepted by executive director Lisa Vossler-Smith. 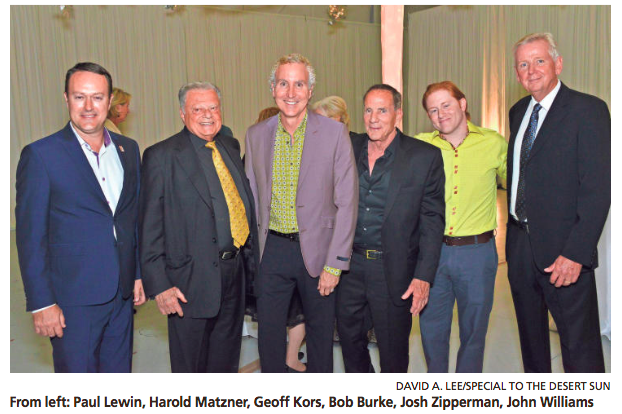 Modernism Week’s Martini’s on the Mountain brought in more than $80,000 benefiting Mizell. The Golden Star Achievement Award was presented by Andy Linsky to Desert AIDS Project for its support of seniors with HIV and its important partnership with Mizell. DAP board chair Barbara Keller accepted the honor. Palm Springs Mayor Steve Pougnet then assisted executive director Ginny Foat in raising enough additional donations to buy a much needed new delivery van. Finally, the ever-generous Harold Matzner matched all donations, so that two new vans can be purchased. The gala rolled along for a long time, but so will the many Meals on Wheels vans crisscrossing our valley. Presenting sponsors were Eisenhower Health and Harold Matzner. Event co-chairs were Dr. Ronald and Carol Fragen, and Eric Rudolph and Bob Iles. Among the guests were Eisenhower CEO Aubrey Serfling and Laurie Serfling, Eisenhower COO Marty Massiello, Steve Tobin, Rick Wade, Fred Noble, Arthur and Kathy Block, Desert Regional CEO Carolyn Caldwell and Daniel Caldwell, Chad Mayes, Rick Hutcheson and Rob Kincaid, Gary Soto, Mark Anton and Scott Histed, Kevin Bass, Darrell Tucci, and Aftab Dada.